Although pumpkin gets most of the attention every fall, we cannot forget about the butternut squash. Sure, maybe it’s not as flashy as the pumpkin. And you can’t really make jack-o-lanterns with them (well, maybe you could, but your kids would hate you). But butternut squash is a little bit easier to deal with when it comes to cooking. Butternut squash fries are the perfect side for a veggie burger and butternut squash soup? Amazing! 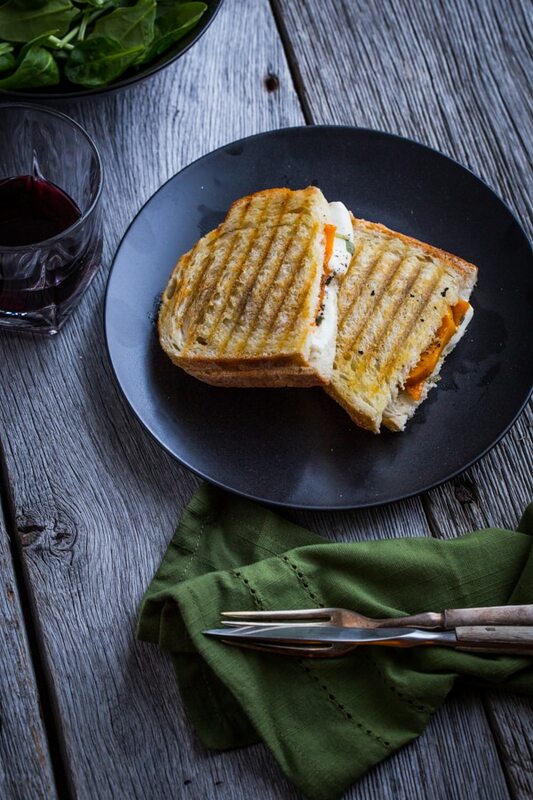 Even if we did have access to Sandwhich deliciousness here in Illinois, I haven’t seen this Roasted Butternut Squash Panini on the menu in a while, so having a recipe for it on hand is kind of vital. It’s really that good. There’s not that much to it — just some roasted butternut, fresh mozzarella, sage and a good sturdy bread — but when you put it all together, it’s pretty magical. This December, we’re republishing updated recipes from Oh My Veggies’ first year. This post was originally published on October 18, 2011. Roasted butternut squash makes a delicious (and different!) filling for panini. Brush the butternut squash slices with olive oil and place them on a rimmed baking sheet. Season with salt and pepper. Bake 40-45 minutes or until tender and just beginning to brown on edges, turning halfway through cooking time. Brush one side of each slice of bread with olive oil. Divide the squash, mozzarella, and sage evenly onto the non-oiled sides of 4 bread slices. Top with remaining slices of bread and grill until golden brown, about 8 minutes. Wow – I never would have though of making a sandwich out of squash. You are one creative girl Kiersten! Oh my! I loooove butternut squash and am so totally making this! We have almost everything so I can make it tonight! I just have to run out and get some mozzarella medallions and I’m set! I’m making it again tonight too! Mostly because we still have tons of sage and I’m too busy to find another recipe, ha. But they are really good. I hope you like them! I love paninis, and I wouldn’t have ever thought of using squash, either. But this sounds delicious! Yummy! I want to get a panini maker. It is one of the kitchen appliances that I don’t own that I could really use. I have a Griddler–I love it because it’s more than just a panini maker. You can use it as a griddle, as a grill, and as a panini press. I always find myself pining for the specialty stuff (like the mini-donut makers! ), but when I get them, I never use them! I’m a bit obsessed with butternut squash. I would have never thought to put it inside of a panini. That’s awesome! I want to thank you for stopping by and leaving such an encouraging comment. I really appreciate it. Have a wonderful Wednesday! I had to comment on your post because I feel the exact same way. I just started a new blog and I felt like it was time for me to finally focus on blogging–I’ve been working 2 part-time jobs (such is the life of someone with a master’s degree in library & information science) and I cut my hours on the one I hated to make time for the new blog. I was so excited about it! And then two days later I got an offer to do freelance taxonomy for a company I’ve worked with in the past and with the holidays coming up, I felt like I couldn’t say no to the money. It’s funny that you mentioned having the wind taken out of your sails in your post because that’s the exact phrase I used when describing how I felt to my husband. So now I’m in a frantic state again trying to balance everything, trying to find time for what I love in between the time I spend on two jobs I feel ambivalent about. What a great idea! It wouldn’t have even occurred to me to make a sandwich of butternut squash. Holy cow, how delicious does that look! I love squash! Sadly I just discovered it a year ago 🙂 Not a Polish veggie I was raised with! So simple but so yummy sounding! I definitely want to make this one! Thanks for this! I was hoping you’d post a recipe!! BTW, can I say how much I love it that you’re a veg too – you always have good ideas for me. Keep em coming! It looks beautiful, though I’m not yet sure about it. I’ve never tried butternut with mozzarella…I may have to test it. And I didn’t know you could make fries with it. I’ll be doing that. We have a ton of butternut squash right now. Well, mozzarella is a pretty mild cheese (especially the fresh stuff), so it goes well. I think parmesan would be really good too because I’ve made some pasta dishes with roasted butternut squash & parm and they are always so yummy, so you could sub that in instead if you’re skeptical. 🙂 And butternut squash fries are SO GOOD! You roast them in the oven & you can play up the sweetness by adding nutmeg and/or cinnamon or do more savory fries by adding cumin or chili powder. Oh, mah, gawd. This looks fantastic! I actually prefer butternut squash over pumpkin (generally). I wonder how it would taste with tarragon or chervil? Those are two of my new favorite spices. I like pumpkin soup and obviously pumpkin baked goods, but I’m not really into roasted pumpkin so much. Unless it’s kabocha, which is really good. You know, I’m sure I’ve had tarragon and chervil, but I really couldn’t say what they taste like. Ha! I am a bad cook. Sounds amazing!! So do the butternut squash fries! I love winter squash. oh my goodness, this looks mouthwateringly delicious! I would have never thought to put it on a sandwich. I just made it chopped up with brown rice, zucchini, kale, and mushrooms. It was tasty!!! Ooh, that sounds really good too. Kale is one of my favorites! That looks amazing! I love squash season!! Looks like quite a gourmet sandwich… definitley my kind of flavors 🙂 Lovely! 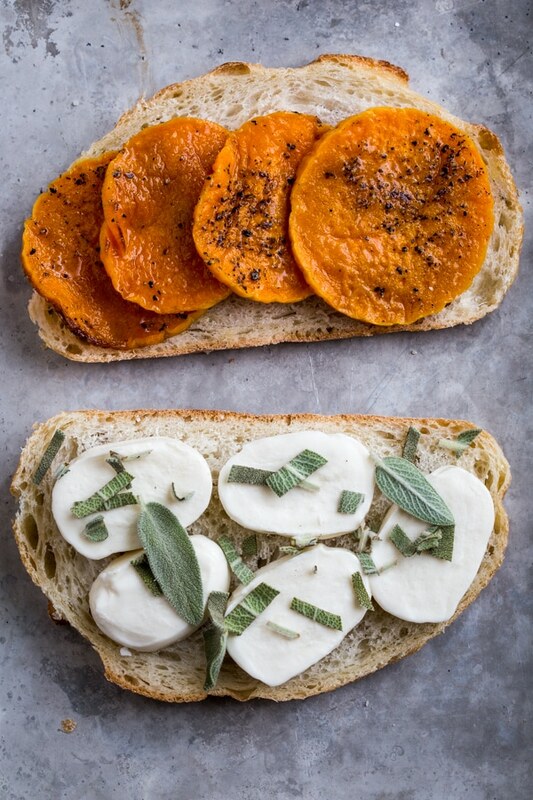 Roasted butternut squash is the best, this is my dream panini! I love to eat crispy sandwiches with butternuts. Simply delicious and healthy. What a wonderful-looking recipe! Adding butternut squash to a sandwich is such a creative idea, and I bet it goes so well with all that melted mozzarella. I’m also based in Chicago and would love to see a better variety of sandwich shops here!